Anyone would think there's an international football tournament happening, what with all these World Cup themed bingo promotions. We're too busy at Cashbacker Towers to notice the football, as we're preoccupied with bringing you the best offers our bingo providers, er, provide. Saying that though, we can't wait until England play Sweden in the quarter final this Saturday at 3pm on BBC1, having just beaten Mexico in the round of 16 following a nerve-shredding penalty shootout. Yeah, we've hardly noticed the World Cup at all. Promise. 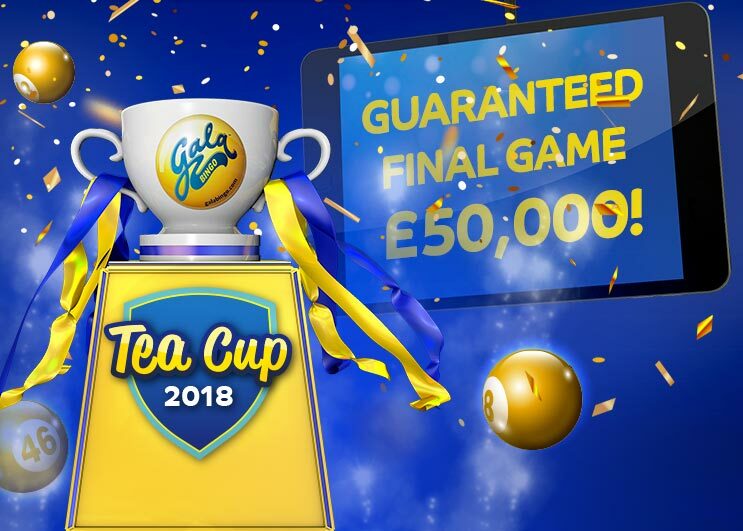 Luckily for you though, Gala bingo certainly have, and their 2018 Gala Tea Cup is as prestigious as winning any trifling football tournament. We barely know there's one on, what with definitely not listening to matches on the radio in the office when they kick off during our working hours. But back to the Gala Tea Cup, as it's the real deal. It'll take some explaining though, as it's quite detailed, with the whole thing formatted like a tournament. You know, like a football tournament maybe. Not that we'd know about such things. Anyway, you can read below how it works, and you'll find this promotion here. There's £50,000 up for grabs in one game of bingo. Full house = £15,000; 2 lines = £7,500; 1 line = £2,500. Semi final games are played on Friday 6 and Friday 13 July. Those tickets are 50p, and give you a chance to win 6 free tickets to the final. They also grant you an equal number of free tickets to the final. Up to £2,500 cash is available to win during the semi finals. You can buy tickets to the final for £1, but there's a limit of 90. The final is held on Sunday 15 July at 9pm, in the City, Country and Mountain rooms. You can play the final by directly purchasing tickets for it, whether buying on the night or pre-purchasing. 1 line = £500 + 6 final tickets; 2 lines = £1,500 + 6 final tickets; full house = £2,500 + 6 final tickets. £500 will be shared by all non-winners of the semi finals. All players will receive a free final ticket equivalent to the number of semi finals they participated in. Players who earn free tickets but don't turn up for the semi final, or haven't bought a final ticket, will not earn a free final ticket. 1 line = £2,500; 2 lines = £7,500; full house = £15,000. Remaining £25,000 is split between non-winning players in the game.